I would make a lousy teenager. Or at least I would be a pretty boring one. I know too much about the way the world works to make the choices that made being 16 so much fun. Then again, my teenage self in this stage of life would be a frightening prospect too. Thankfully those scenarios are mostly the preserve of B grade comedies. We know a lot about how we develop as we move through the different stages of psychological development, from new born through teenage years, mid life and to old age. And via similar analysis, we know an increasing amount about how societies have developed over the centuries. Researchers have different ways to describe the progression, but as with developmental psychology there are common patterns. Our collective consciousness has evolved over time to keep pace with the opportunities and challenges humans have faced collectively. As new environments emerge, we develop new and sometimes surprising perspectives which eventually become normalised. For example, the feudal system was never going to support the economic development that flourished as monarchies rose and then democracies. It would have been inconceivable as a peasant in a feudal environment to imagine the mindsets that would be commonplace in later societies. Or more recently, a paper based system would never have supported the access to banking services experienced in developing economies today. 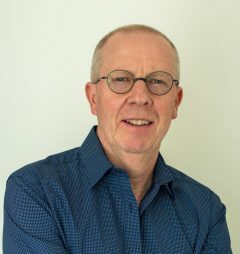 Even Mr Jones, (or Fruitcake as we affectionately called him) the geeky computer science teacher at my high school when there was one computer in the whole school, would have had no skerrick of an inkling of the empowerment we experience as citizens via our connected devices. The mainstream thinking in any society is bound by the dominant worldview. So much so that we tend to believe what we have is ‘better’ than what has come before, and for most of us, we are sceptical of future predictions because our view of the world is deeply rooted in the prevailing wisdom of the time. For example, how many of us can genuinely conceive of a system of governance that offers more than parliamentary democracy? A relatively new book applies this logic to organisations. Frederic Laloux’s somewhat benignly titled Reinventing Organisations brings together into one text so much of what I have been observing, experimenting with, advocating for and curious about over the last 15 years. Laloux maps different organisational practices to the evolution of human consciousness. 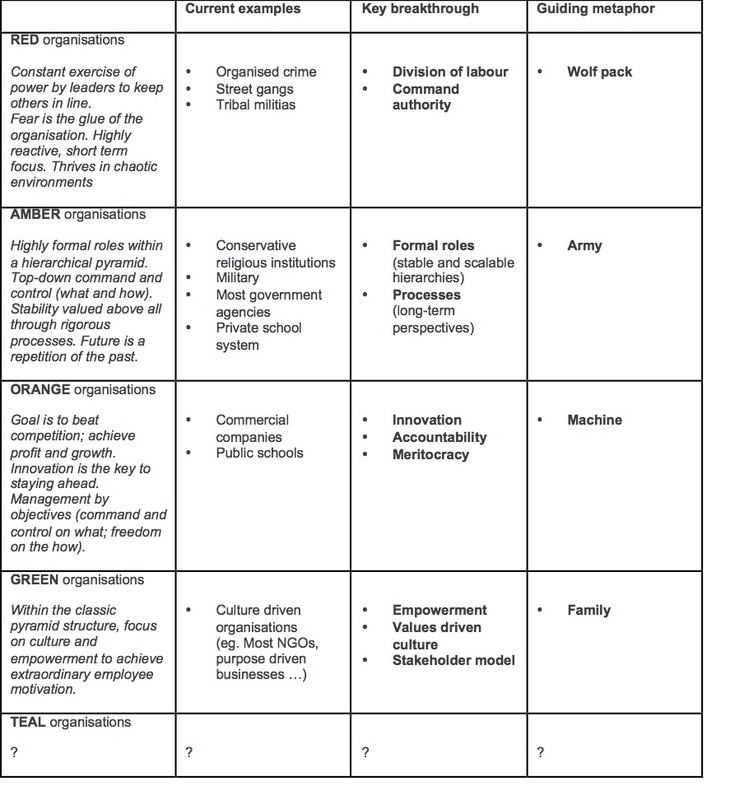 This table is an adaption of a table on page 36 of Laloux’s book. William Gibson (who also incidentally coined the term cyberspace) is famously quoted as saying that “the future is already here, its just unevenly distributed”. So in his book Laloux researches organisations that appear to be giving us a glimpse of the future. Of course we cannot predict the future, but we can get a sense of where we are going. The most insightful thinkers at the turn of the 20th century predicted that the car would take over from horses as civilisation’s main form of transport. But few could have foreseen the infrastructure development (sealed road networks etc) that evolved in the succeeding decades. In the same way, who knows what the key breakthroughs Laloux identifies will ultimately facilitate in the development of our consciousness and practice in the coming decades? Not me, but I’m looking forward to seeing it. The three breakthroughs in evolutionary TEAL organisations might not sound particularly radical. However, as these new ways of thinking and being become normative, our workplaces and lifestyles will change dramatically. Most of my current work by the way, feels like helping organisations shaped by ORANGE practices move to more GREEN practices. I hope I am working long enough for most of my work to be to helping teams and organisations transition from attitudes and behaviours that reflect GREEN to those associated with TEAL. My observations are that the future is already being shaped by organisations that are intuitively operating with TEAL practices. I fear for those who are stuck in ORANGE. Many of them have forward thinking leadership, but the organisational paradigms and related systems are deeply imbedded. These words don’t convey much, but I am enjoying thinking about what this might look as illustrated by organisations that are already doing it, and will include some thoughts in upcoming blogs.